I've already posted about my 10-year blogiversary (click that link to go win something), but after I drafted that post up, I started thinking about all of the things I've shared with you guys over the years. Favorite posts and whatnot..so this is a short retrospective of some of my favorite posts from the past decade. One of the most exciting interviews I ever had a chance to do...an illustrated one with Lucy Knisley. An unlikely review and a story about the inexplicable that strikes so very close to my heart. I never expected to be unemployed, and I really never expected to be grateful for unemployment. Introducing...Greyson! This one doesn't need any explanation. The post I (almost) never wrote about the wedding. Oops! I could've included my review of The Sparrow, because THAT BOOK, but I'll choose something different this time. That time I met Heather. A slightly earlier iteration of "What Book Blogging Means to Me." Finally, are book bloggers relevant? I think you'll know what I THINK. What's your favorite thing YOU'VE written on your blog? Enjoyed looking back at these posts. I've come in and out of the blogging world and have checked in here off and on. 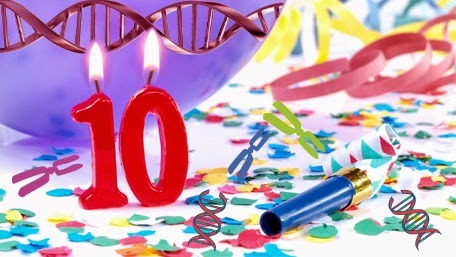 I'm glad to be back and glad to wish you "Happy 10th" and take a look at your "10 favorites". Congrats! Awww, thank you for coming over, Kay! This post made me feel all warm and fuzzy inside. These are some fantastic memories! I had to go back and look at the early pictures of sweet Greyson. I can't believe how he's grown! The time has flown by! I loved revisiting those, Kathy. Hard to believe he's grown so fast. I loved re-reading some of those posts. Your blog is one of my favorites and I'm so glad you've kept blogging all of these years. Talk about some great posts! 10 years! *bowing to you* That is so amazing!!!! Thanks, Sheila! I really can't believe it's been that long. Great posts all! Fun to see the variety -- and several I remember reading for the first time. You are great at what you do! One of my favorites of yours was the time you told the publishing companies to jam their ARC's...well, sort of. You were much nicer about it. But, you gave me a freedom from internal pressure with that particular post. As for introducing Greyson, who doesn't love their son (and reading about other's) with everything they are?! Yes ma'am! That was one of my faves, too. I've revisited that territory several times. It's become a bit of a mantra. hehe I'm so glad that post could help you feel freed from internal pressure. I think we're our own worst enemies sometimes. You've been one of the bloggers who has taught me that my blog is mine and that I don't have to do it just so and I can make it personal. Thanks for sharing for all of these years! That makes me happy, Lisa! Cheers to personal and doing what we want! Thanks for this compilation - some of theses posts are from before I came across your blog. I especially enjoyed the baby pictures :) I don't have as many posts to choose from, but my favourites are the reviews I'm proudest of. What a great list! I'm excited to go back and read some posts from those sad years when I didn't know about your blog yet! I'm really excited to read the interview with Lucy Knisley, since I just finished Relish. Thanks for sharing these, and happy ten years! Wow, ten years! That's like 20 lifetimes in "Internet years." Congratulations on reaching such a huge milestone!